Bark is a web-based services platform designed to connect buyers with service providers. This marketplace sends freelancers requests from clients who are relevant to their skills and location. Whether you want to accomplish your fitness goals with a personal trainer, want someone to teach your kids music, a photographer for your special event, someone to decorate your home, etc. Bark is the best place to easily hire the right person to get all the tasks done professionally. Some of the top services offered by Bark include; wedding photography, wedding videography, dog training, pet sitting, counseling, therapist, web design, graphic design, engraving, pet grooming, mortgage advice, life coaching, etc. Bark presents one of the easiest and quickest way to secure the services of a local professional. 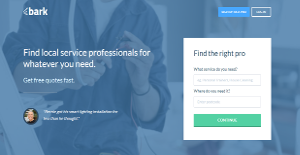 This platform saves you time by contacting local professionals on your behalf. Search for pros on google and leaving them messages can be frustrating because most of them never reply. Bark does all the asking for you and connects you with the right experts for your job. This ensures you get someone who is genuinely interested in your job in the shortest time possible. In addition, this platform contacts a wider scope of professionals including those not signed up on the platform. That way they ensure you get numerous options which help you to make the best choice possible. With Bark, all your conversations are managed in the Bark messenger. This is a secure inbox which ensures you do not lose estimates and contacts details shared by potential service providers. Moreover, the platform has a great team of bright customer care staff. They care about the quality of services offered to all their client. The team works tirelessly to ensure your projects are accomplished within your timelines. Bark has built a good reputation. With their mission to make finding pros as easy as possible, it’s easy to see why many people turn to this platform. It has revolutionized how people hire or sell services online. If you are considering bark it may also be beneficial to examine other subcategories of Best Freelance Platforms listed in our database of B2B software reviews. Each company is different, and may need a specific Freelance Platforms solution that will be adjusted to their company size, type of clients and employees and even particular industry they deal with. We advise you don't count on getting an ideal services that is going to work for each company no matter what their background is. It may be a good idea to read a few bark reviews first and even then you should pay attention to what the service is supposed to do for your company and your workers. Do you require a simple and intuitive service with only essential functions? Will you really use the complex functionalities required by pros and big enterprises? Are there any particular features that are especially beneficial for the industry you operate in? If you ask yourself these questions it will be much easier to find a reliable solution that will match your budget. We realize that when you make a decision to buy Freelance Platforms it’s important not only to see how experts evaluate it in their reviews, but also to find out if the real people and companies that buy it are actually satisfied with the product. That’s why we’ve created our behavior-based Customer Satisfaction Algorithm™ that gathers customer reviews, comments and bark reviews across a wide range of social media sites. The data is then presented in an easy to digest form showing how many people had positive and negative experience with bark. With that information at hand you should be equipped to make an informed buying decision that you won’t regret. Bark.com provides poor customer service and does not stand by their promises. What are bark pricing details? What integrations are available for bark? Pros: None at all terrible product and everyone should avoid. Cons: Automatically billed me, when I complained 10mins afterwards when I realised the error they refused to give me my money back. They have also not responded to my request for my details and to speak to their GDPR officer. Closed my account after I complained and "bought" leadsSpam email, poor customer service. Avoid at all costs. None at all terrible product and everyone should avoid. They are fake. So there aren’t any best aspects of the company. The only good thing is the ease of signing up and setting up a profile. If you need more information about bark or you simply have a question let us know what you need and we’ll forward your request directly to the vendor.